**Disclosure: This is a sponsored post. Product was provided at not cost. All opinions are of my own. Our family tries to have movie or game night every Friday night when time allows. Not only do we love to have fun as a family but we also love to eat! Our favorite snack - a family owned & operated artisan popcorn purveyor, Popcornopolis. 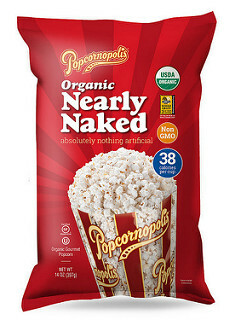 This delicious, light & fluffy popcorn is Gluten-Free, has only 38 calories per cup, is non-GMO & USDA Certified Organic. Can it get any better!? Yes! It can! This bag is absolutely huge! When we use to make microwave popcorn we'd have to make at least three bags & we would go through so many boxes. With Popcornopolis this bag can literally last the entire month for us! Every bag is made fresh with pure coconut oil - which I love! It's so light, airy & very easy to eat right out of the bag! From now through May 13th you can pick up this huge bag of popcorn for only $3.49 at Costco! !